Olmsted, American park systems, and their geographical integration as guide to a future urbanism. Michel Desvigne has explored methods to intelligently revive and renew the approach of American landscape architect Frederick Law Olmsted (1822-1903). Originator, among others, of Boston's “park systems”, Olmsted based these systems on a series of hydraulic and vegetal devices, to which Desvigne offers a rereading. Transplanting the idea of the American park systems of the 19th Century could effectively serve in structuring European urban peripheries. Just as these parks served at times to structure the growth of cities, their typology transplanted into the present could indeed help constitute a structure and limit to contemporary urban sprawl. The vestiges of this geography, infrastructure networks and industrial sites, are the potential places for such an urban recovery. Notwithstanding the role American parks played as a reference for France's new and emerging cities in the late sixties, they were assimilated in the creation of urban greenways that have little sense to them, that in no significant measure allude to the real possibility of nature in the city. Living in the United States, I became ever more interested in these parks, studying them from up close, visiting the house of Olmsted himself in Brookline (near Boston), gaining, it seemed to me, a better understanding of how they produced and molded the urban structure. This is evidenced by the transformation of Washington from 1901 to 1950 carried out in part by Olmsted's son. The designers studied very attentively the preexisting geography. This became especially relevant as the expanding cities were being spread out and established on territory relatively poor in terms of nature, often on marshy land, with nondescript landscapes, where nature was barely present, except in constrained form. The territory was carefully and closely examined, to the point where each little valley and dip of the land was observed, each tributary emerging from the larger valleys studied, tributaries that by the time they reached the territory were little more than drainage residue, open-air sewers. Photographs from the end of the 19th Century still reveal the presence of what were essentially thalwegs, the upstream sections where rivers would be formed. Extraordinary projects for amplifying and developing the geography were then drawn up: Olmsted and his son, as landscape architects, took an existing valley, with the small valley below it still in the form of a sewer, and magnified the presence of nature. They abundantly planted along hillsides and valleys, dramatically shifting and directing the flow of water, setting up all the servicing of their site, most notably roads for traffic, and in such a way helped guide the evolution of the city. What is extraordinary is that their way of servicing and developing the city was based upon an understanding of its geography, of nature itself. Olmsted, a writer, was close to the transcendental philosophers Emerson and Thoreau, naturalists of pragmatic tendencies. Thoreau lived in a cabin on Walden Pond near Concord, Massachusetts – a sort of worldly hermit, living not far from Harvard University where Emerson was chair of the philosophy department. This pragmatic naturalism seems to me both entirely current and uniquely relevant in light of our awareness of the potential nature offers us. The materials Olmsted took advantage of are not those that make up picturesque gardens, nor those that gave shape to the landscape gardens of Europe during the same period. Olmsted worked with the woods, marshes, meadows, expanses of water, all elementary materials profoundly inscribed in geography and nature. The park system of Minneapolis unites the Mississippi river with a collection of Minnesota lakes, which although done through a number of artificial elements, succeeds in imparting to the whole an appearance of natural geography. An expansive park system with around 40 miles of urban buildings facing onto it, it stands as a true monument of the city. Similarly, The Olmsted firm’s design for the park system in Boston covers a large expanse of tens and tens of miles. The powerful ability that these landscape architects possessed in implementing nature for the structuring and organization of whole large scale cities remains completely foreign to us. It is essential that we closely examine these park systems' dimensions, taking into consideration and contemplating their application on our own territories. This is what guided our planning project for the research-intensive scientific cluster at Paris-Saclay. 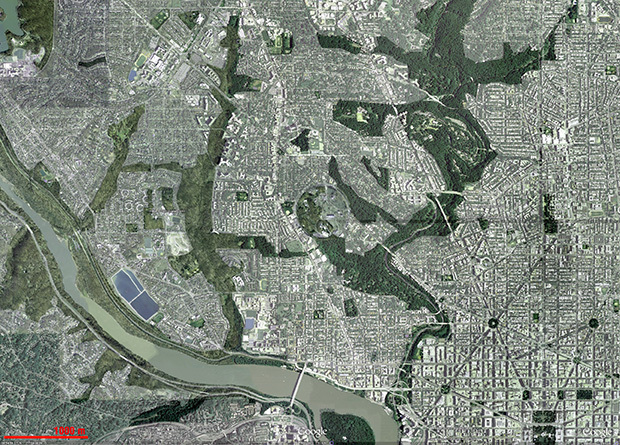 The southern part of the designed scientific cluster could be superimposed almost exactly over the western expansion of Washington. Our preparatory research included developing links and similarities from traces found in the work of Olmsted's son from 1901 to 1950 through documents, photographs, drawings, and cuttings of how the project was managed over time. In our day and age, it is a matter of knowing how to create a territory not less the size of a Boston or a Minneapolis. Seeing that this team worked for fifty years on the same city of Washington only encourages us. The result of their work remains extraordinary, continuing to function in welcoming and incorporating current urbanization, lending to it meaning, structure, and quality of life. It is not unrealistic to conceive of a fifty year management project for the composition of a landscape, a geography to be amplified for the city of tomorrow.